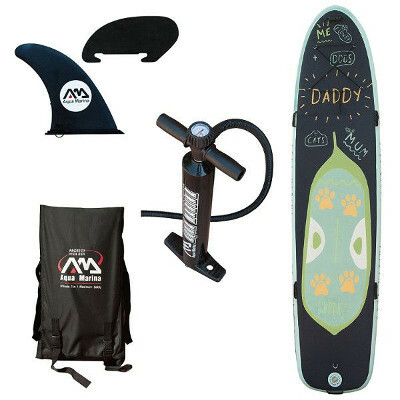 Aqua Marina is one of the boldest names in the industry of inflatable stand uop paddle boards. They’re globally known for their quality iSUPs which target all different categories of riders and needs. Family is one of Aqua Marina’s interests because they are aware that there is no better time than that spent with family on the beach, river or lake. That’s why they made the Super Trip, an inflatable board made specifically to meet the needs of a family for fun and recreation in water. In this review, we’ll get to know more about the specifications and features of this board which might end up being a good investment for you and your family. As you can clearly see, the Aqua Marina Super Trip is super large. This board is a family board par excellence; it measures 12.2 feet in length, 34 inches in width and 6 inches for thickness. Being familiar with other standard iSUPs, the Super Trip was an amazement to see in full size fully inflated; it can hold up to 397 lbs which can be translated into two fully grown adults plus one small rider or a parent with two children in this case. With those 34 inches, the Super Trip is super stable it simulates a water platform. You might think that I’m exaggerating but you’d know what I’m talking about once you stand tall on top of the board; it’s really big it feels like you can take a walk on it. Not only that; its thickness plays a great role in making it even more balanced even when it reaches weight limits; it’s almost impossible to make it bend especially in water. 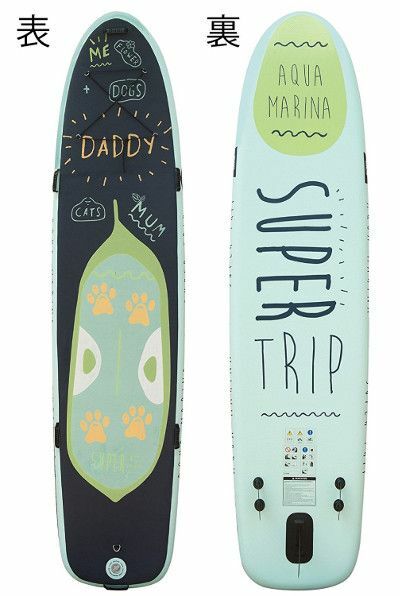 The makers of the Aqua Marina Super Trip wanted it to be a strong and fun family board. The kids will love the colorful design, and as an adult, you’ll surely appreciate the steady performance. 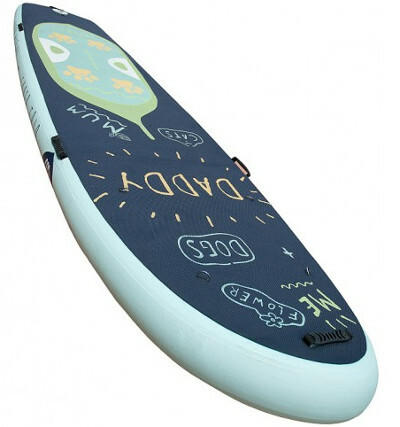 As a matter fact, inflatable stand up paddle boards are gaining a lot of popularity in the last few years especially amongst people who are into water activities since it’s a very friendly sport that can be picked up by anyone with any size or age. That being stated, Aqua Marina makes sure to choose quality materials to build each and every iSUP of theirs which only reflects how serious and passionate they are about what they’re doing. The Aqua Marina Super Trip is made of a durable double wall drop stitch PVC with additional fibers sewn into the inside wall of the top and bottom layers for increased rigidity. 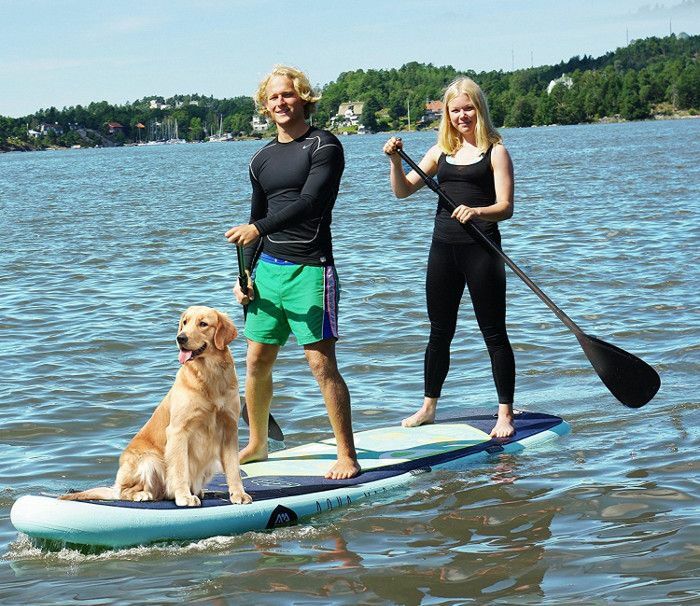 Together, they give you an extremely stiff, durable and strong inflatable paddle board which can serve you and your family for years. Also, this board’s back is heat embossed which make it virtually indestructible. All in all, I’d say that the Super Trip is one of the Aqua Marina’s most durable iSUPs with a great and considerate concept to meet a family’s need for safety and fun. This part is what makes standup paddle boarding special and fun. Most quality boards are built with some features and options which by now can be called standard for this water sport. A dot groove traction pad that covers the board’s back completely for maximum utility of that space. It’s also amazing since children would be moving around on the board without their feet skidding off. 4 durable D-rings that are connected with a bungee cord on the board’s deck; they’ll allow you to secure your cargo easily and safely. A 5th D-ring is on the board’s tail if you feel the need to attach a safety leash. You’ll also find 6 carry handles that are made of rubbery material for extreme comfort while carrying the inflated board around. Given the fact that it’s a family board that measure 12.2 feet tall; anyone who tries to transport it will need a little help especially children. Finally, the Super Trip is featured with a tri-fin navigation system for best tracking. One fin is large and central while are the two are smaller and are on the sides. They’re all removable for easy and safe packing. To start with, speed is not the Super Trip’s greatest quality because simply; it’s not made to be a fast board. This board is designed to make family time a quality time that is fun, safe and practical. The Aqua Marina Super Trip is really stable even with 2 adults on it; it tracks smoothly and it responds to your body and the paddle nicely and quickly. It might be a little demanding to control the board when it reaches max weight, thus, it is recommended to get two paddles for when two people are on board. A Magic backpack where you can fit the whole thing. As you can see, there’s no paddle which is a bummer honestly. However, it’s not that bad given all the great things about the Super Trip. The Aqua Marina Super Trip is a huge family iSUP par excellence. It’s extremely rigid and durable. It’s featured with one of the largest traction pads covering the whole back. It’s one of the most stable and balanced iSUPs out there. It can take up to 3 riders (2 adults and a child or 1 adult and 2 children). The only thing lacking is the paddle as mentioned earlier. However, you’d still need another paddle since it’s a really large board. Another thing to mention is that the Super Trip comes on the heavy side for an iSUP which is only normal given its side and purpose. I’d recommend an electric pump to inflate this board to save time an effort.